Vladimir Posvyanskiy and Per Hedegård Niels Bohr Institute, University of Copenhagen. Graphene is a single layer of graphite consisted of carbon atoms bonded in a hexagonal lattice. Because of its electrical properties graphene differs drastically from conventional 2D materials. Thus, in the absence of Coulomb interaction there is a unique gap in a particle-hole spectrum of doped graphene. We show that presence of Coulomb correlations leads to appearance of new bound states in this gap which correspond to a neutral spin-triplet mode, a magnon. Coulomb interaction is examined in the context of the Hubbard and the Pariser-Parr-Pople (PPP) models. The last one takes into account long range nature of interaction. As a result of our calculations the spectrum of triplet excitations in graphene is presented. It is shown how the model we choose affects the properties of these excitations. In addition, we discuss the conditions when magnons can be formed in the systems. Finally, we demonstrate that magnons can appear in singe-walled carbon nanotubes, as well. 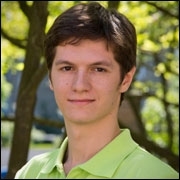 Vladimir Posvyanskiy is currently a PhD student at Niels Bohr Institute, University of Copenhagen under the supervision of Professor Per Hedegård. His project is focused on the theoretical investigation of some graphene and carbon nanotubes properties, such as existence of magnetic excitations in these systems. He obtained his masters degree at Moscow State University, Department of Physics, Chair of Quantum Electronics (2013) where he studied time-dependent tunneling in the low-dimension systems.